Hyderabad: The Hyderabad Metro Rail Ltd. (HMRL) made its first phase of 71-km elevated metro rail project to open in November. Started in July 2012, the Hyderabad Metro Rail (HMR) project was scheduled to be completed by June this year. However, it got delayed due to land acquisition and other issues. To inaugurate the first phase of the Metro rail project, Telangana Chief Minister K Chandrasekhar Rao has invited Prime Minister Narendra Modi, who will be in the city from November 28 to 30 to attend the Global Entrepreneurship Summit. 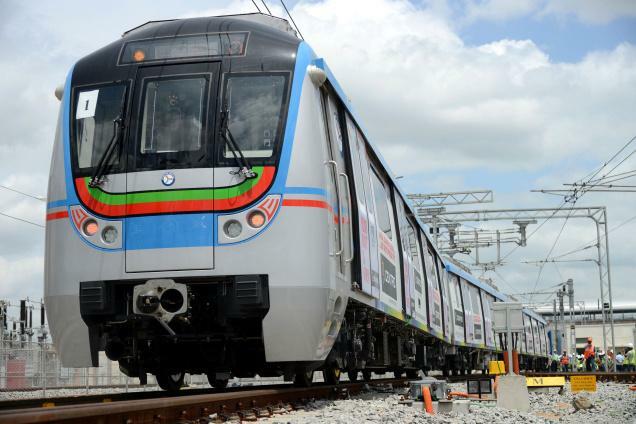 The Hyderabad metro rail under Larsen and Toubro will cover a total distance of 71 kms. The first phase is of 29-km stretch from Miyapur to LB Nagar and consists of 27 stations. The second phase is a 15-km stretch from Jubilee Bus Stand to Falaknuma which comprises of 16 stations. The third phase will cover a 28-km stretch from Nagole to Shilparamam with 23 stations. The metro will run on an elevated track and will connect major offices, retail and residential areas. The stations will be of world-class standards and will be located at a distance of every kilometre. The metro will connect rail terminals at Secunderabad, Begumpet, Nampally and major bus stations at Miyapur, MGBS, Koti, Dilsukhnagar, Charminar and Jubilee Bus Station. The coaches will be of ultra-modern facilities and there will be high frequency of trains. To facilitate commuters, there will be availability of feeder bus services from different areas. The stations will be user-friendly with automatic ticket vending machines and have special facilities for the disabled persons. It will also have essential facilities like toilets, telephones, public address and information system.